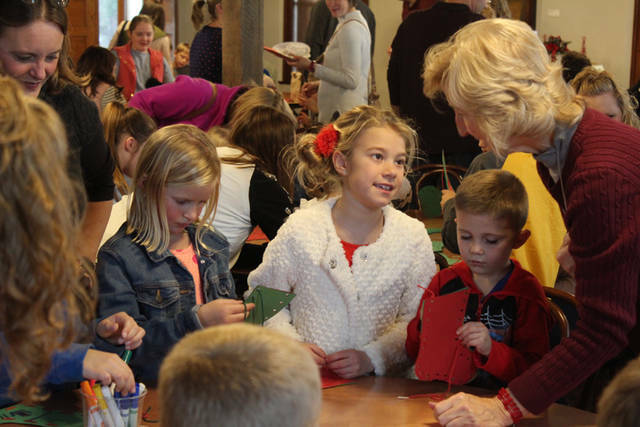 St. Nicholas visited the at Maria Stein Shrine on Sunday. 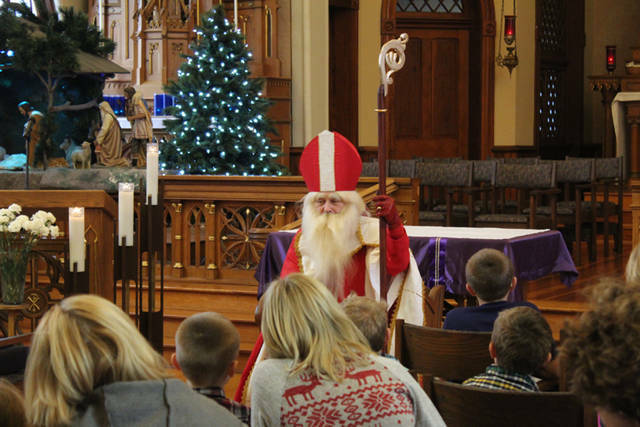 MARIA STEIN – More than 80 children and their families met in the Adoration Chapel at Maria Stein Shrine on Sunday for a special visit from St. Nicholas. He shared details about his life and how his generosity mirrored that of Jesus’s self-giving. He chronicled the time that he paid the dowry for three young women to get married, calmed a storm thus saving a ship full of men and gave many gifts anonymously. Before entering the Chapel, the children left their shoes in the hallway and were excited to see St. Nicholas had left treats inside. 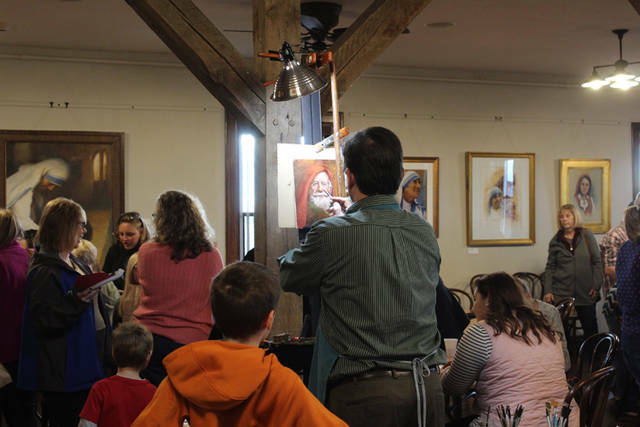 The day continued with crafts, cookies, hot cocoa and a special appearance by renowned artist Tim Langenderfer. Langenderfer hand-painted a portrait of St. Nicholas, and the children enjoyed watching their beloved saint come to life on canvas. Langenderfer then gave the painting away as a door prize, as well as a printed copy, to the children in attendance. The lucky winners were Joan Slonkosky (painting) and Brynn and Olivia Miller (print). The coloring contest winners were: 5 years, Parker King and Jetson Thomas; 6 years, Ashlyn Chalk and Cameron Bodart; 7 years, Kamryn Schroeder and Tyler Homan; 8 years, Elizabeth Grieshop and Jackson Hoenie; 9 years, Lilly Walke and Will Rethman; 10 years, Elli Stammen and Caleb Westerheidi; 11 years, Payton DeMange and Avery Stachler; and 12 years, Andrew Wuebker and Kelly Thompson. Each child received a children’s nativity set.